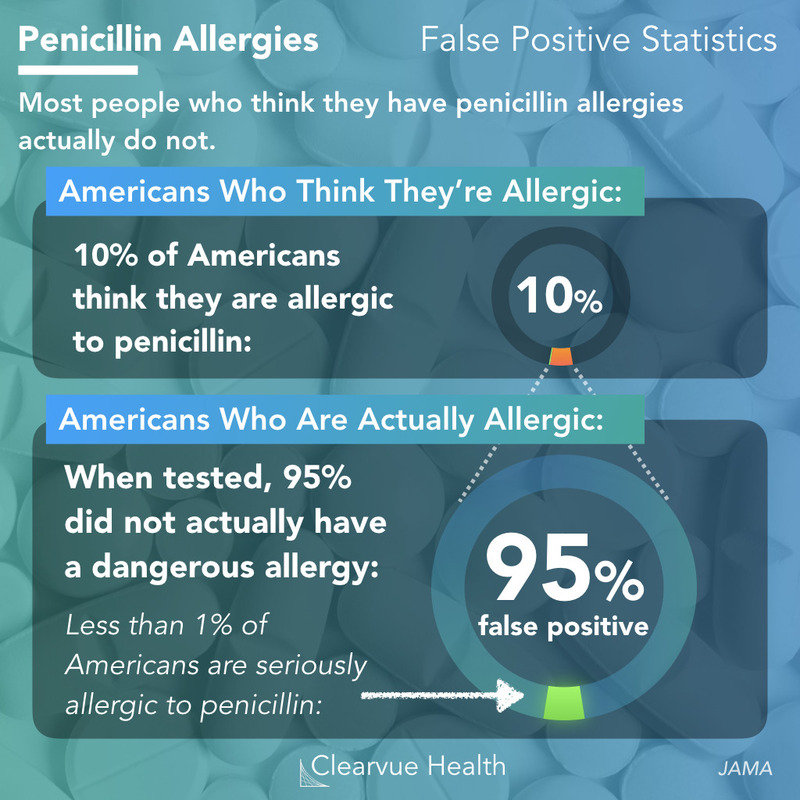 10% of Americans are diagnosed as having a penicillin allergy. In reality, only 5% are actually unable to take penicillin based antibiotics. This over diagnosis leads to patients not getting the antibiotics they need, and potentially exposes patients to risky side effects. 32 Million Americans are documented or diagnosed as having a penicillin allergy. When they go to the hospital or their local clinic, this designation often is not questioned and they are treated with alternative antibiotics. However, when tested, only 5% of these patients actually have a true allergy. With our heightened awareness of drug reactions as a society, many patients who had completely harmless side effects have been falsely diagnosed as having penicillin allergies. According to this research, most patients who have been diagnosed as having a penicillin allergy may actually be able to take these important antibiotics. Penicillin by itself is not as widely prescribed as it once was due to increased resistance. However, its derivatives continue to be prescribed for a wide range of infections. Antibiotics in the penicillin family are generally very safe and effective against a wide range of bacteria. Despite increasing antibiotic resistance, they remain the first and top choice for doctors for many infections. 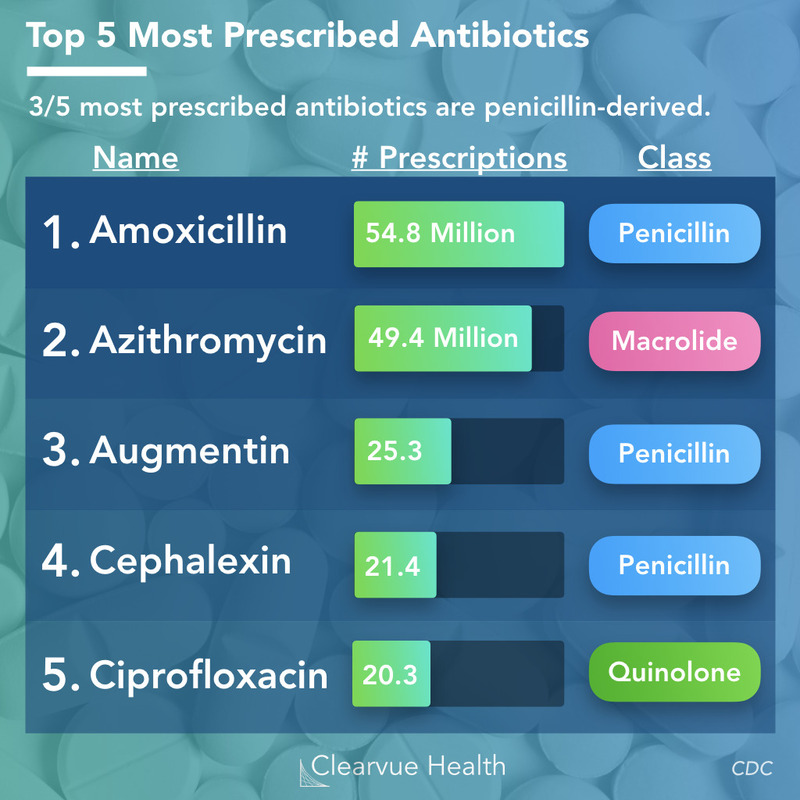 According to the CDC, three out of the top 5 most prescribed antibiotics are derived from penicillin. Typically, these are avoided in patients who have penicillin allergies. This becomes problematic as each antibiotic only works for certain diseases. When a patient is potentially allergic to penicillin, doctors often have to resort to second line or back-up antibiotics. These tend to have worse side-effects, and may potentially cause dangerous secondary infections such as VRE or MRSA. 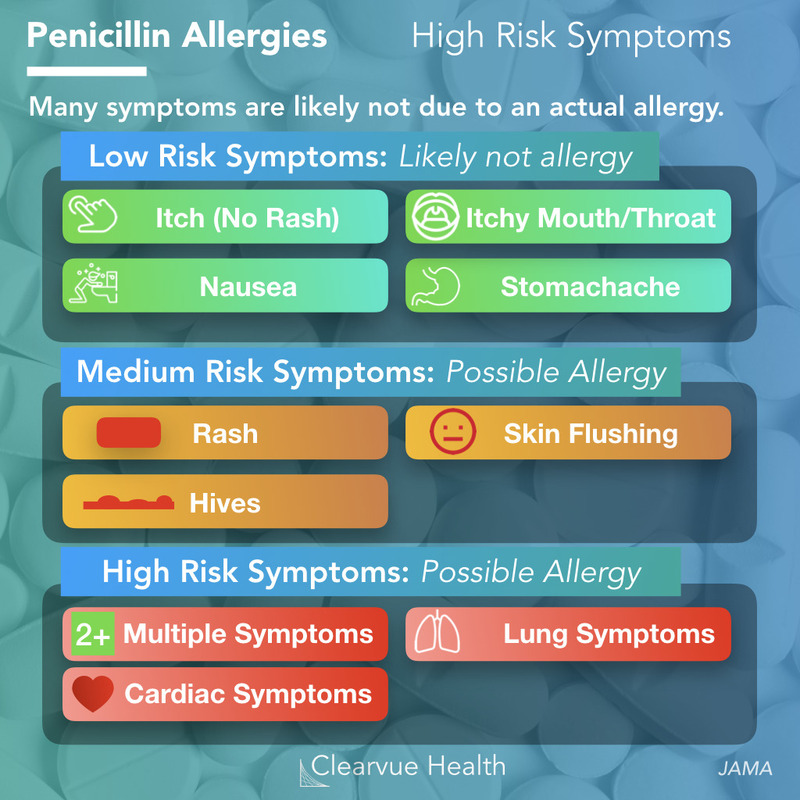 Penicillin Allergy Symptoms: How to tell if its real? If you suspect you have a penicillin allergy, be sure to tell your doctor. As with any safety issue, it is better to err on the side of caution. When you do tell your doctor however, be sure to also tell about your symptoms. Many practitioners simply will label patients as "allergic" without checking to see whether their symptoms actually qualify as an allergy, and this is a disservice to patients. Based on a recent review by Erica S. Shenoy, MD, PhD and her colleagues, we have put together this list of common symptoms categorized by their potential allergy risk. If you do have any of the symptoms below, be sure to tell your doctor so your doctor can decide whether they are potentially dangerous. Symptoms such as a rash with no itch, an itchy throat or an itchy mouth may sound scary, but by themselves are harmless in the case of penicillin. If you do get these when you take penicillin, and no other symptoms, you likely do not have a dangerous allergy. However, be sure to tell your doctor anyways just in case. Nausea, stomachache, or other gastrointestinal symptoms, if they are vague and isolated, are also less likely to be dangerous. If you have symptoms such as a rash or hives (little bumps) when you take antibiotics, you may a more serious allergy. Similarly, skin flushing or the feeling of warmth and blood rushing to your skin, is a sign of a possible peniclllin allergy. If you have symptoms involving multiple systems in your body (e.g. rash and vomiting), you may have a serious allergy. If you have any heart symptoms, such as fainting, heart beating fast, chest pain, or sense of impending doom, you have a higher chance of having a serious allergy. If you have lung symptoms such as cough, shortness of breath, chest tightness, wheezing, or even runny nose/nasal congestion, you also have a higher chance of a serious allergy.